There are 3 types of TST TPMS monitors. 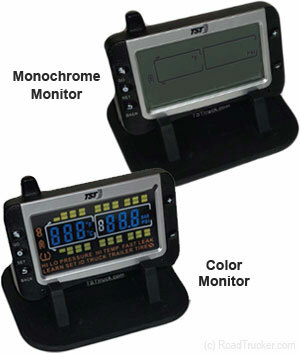 The first is the TST 507 Grayscal TPMS Monitor, which is specifically designed for Tractor Trailers. It has the ability to switch trailers (Drop & Hook), very easily. The 2nd is the TST 507 TPMS Color Monitor, which has all the functionality of the Grayscale monitor with the addition of color. 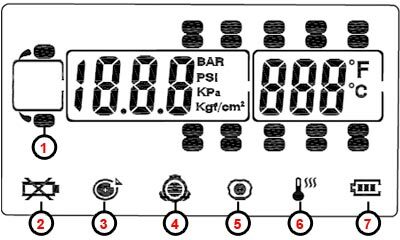 The 3d is the TST 510 TPMS Monitor, which is similar to the 507 monitor, except it handles 510 sensors which are 4 digit IDs, as opposed to the 507 sensors, which have 6 digit IDs. Note The 507 sensors are NOT compatible with the 510 sensors. The 510 Series is being discontinued and Kits are no longer available. The TST monitors alert you with both visual warnings and audible alarms when the temperature and pressure thresholds are exceed. Monitors can read up to 110 Sensors accurately and without fail.